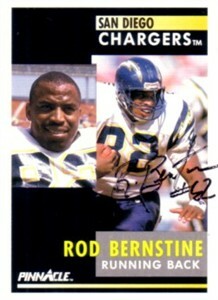 1991 Pinnacle card autographed by former San Diego Chargers bruising running back Rod Bernstine. ONLY ONE OF THIS CARD AVAILABLE FOR SALE. Obtained in person, with certificate of authenticity from AutographsForSale.com.